The sunny, warm weekend made Thursday Friday a great day for baseball and energized the Cruisers to take one win from the weekend. On Thursday, March 21, the Cruisers played host to league opponent the River Ridge Hawks. Collin Blake got the ball for the Cruisers. He scattered four hits through four innings and only gave up one run. Jarod Humphrey came on as relief in the fifth inning. He gave up three runs on five hits and took the loss for the Cruisers. Offensively for the Cruisers, the top third of the lineup, Smith, Hanly and Wiklund, each collected two hits apiece with Smith and Wiklund both hitting triples. The Cruisers took the “L” with the final score River Ridge 4 and Eatonville 3. Cruiser senior Andy Wiklund started on the mound as Eatonville took on the Hoquiam Grizzlies at historic Olympic Stadium in Hoquiam on Friday, March 22. Wiklund held the Grizzlies hitless through five innings of work, before turning the ball over to reliever Blain Hanly. 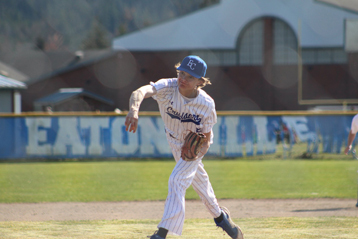 Hanly gave up two runs on three hits to pick up the save for Eatonville. At the plate, Zach Smith continued his hot hitting by going 3-3 at the plate with a triple and two doubles, scoring a run and driving in two. Wiklund also went go 3-3 with two doubles and he drove in a run to help the Cruisers take the win 4-2.